The Warner Sallman Collection at Anderson University includes around 40 oil paintings, as well as pastels, watercolors, pen and ink drawings, and bits of typography produced by Warner Sallman. In all, the collection numbers about 200 items, in addition to Sallman’s student work, which his son donated to the university after the artist’s death. Editor’s Note: The following is an excerpt from a 1994 exhibition catalogue by Dr. David Morgan, Department of Art, Valparaiso University. Used with permission. Sallman images copyrighted by Warner Press, Inc. Used with permission. By far the most popular of Sallman’s pictures, the Head of Christ has been reproduced more than 500 million times according to its publishers (Kriebel & Bates). Anthony Kriebel and Fred Bates, employees of the Gospel Trumpet Company of Anderson, Ind., arranged to market the image late in 1940. Reproductions subsequently carried their imprimatur and the copyright date of 1941. Chicago Offset Printing Company printed the image in a six-color separation lithographic process that preserved what many admirers consider unique about the picture: its radiant, incandescent glow. During the years of the Second World War, one press at Chicago Offset continuously printed the Head of Christ under the operation of two shifts of laborers. In a document written in 1945, the publishers indicate that by the previous year a total of 14 million single pictures had been printed. One run of the image, which required three to four weeks to complete from start to finish, consisted of 5,000 sheets and included a variety of sizes of the Head of Christ, ranging from 20 x 16 to 3 ½ x 2 ½ inches. Several runs were already completed in 1941. By 1944, the market supported increasing the size of individual prints to 40 x 30 inches for large images to be used in public spaces such as churches and YMCAs. The image was marketed in an inexpensively framed format; as cards bearing devotional texts; and on greeting cards, church bulletins, clocks, lamps, buttons, and funeral announcements to name only a few examples. Sales catalogs and promotional literature advertised Sallman’s principal paintings each year. 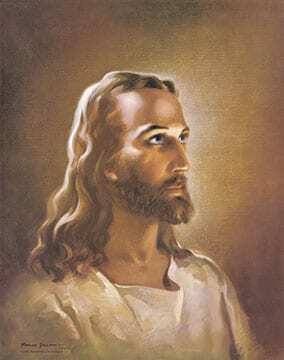 The Head of Christ became the virtual trademark of Kriebel & Bates and so quickly found public acceptance that the publishers encouraged Sallman to use the head as frequently as possible in other depictions of Christ. The artist complied by duplicating the head in other images, rotating it to reveal more of the face, and reversing it as in Christ Our Pilot. The barely concealed heart produced by the luminance of Christ and the frame of the doorway convey Christ’s call to the soul ensnared in thistles of sin and the darkness of ignorance and willfulness. Yet, as promotional literature points out, “all is not hopeless, for there is an opening of grillwork in the door ‘revealing the darkness within,’ so that the individual may see who is at the door, and see that He is good and kind.” For American Protestants whose spirituality is premised on the acceptance of a call and “born again” experience and its subsequent testimonial, this image articulates a central theological principle and has served to commemorate such experiences. For others, the image offers assurance of Christ’s benevolent yet persistent love. Still others interpret the image in terms of the freedom of will. A Lutheran clergyman admires the painting “because the absence of any outside knob or latch on the door indicates that one must open one’s heart to Christ from within — He will not force His way inside.” In either case, the highly symbolic or allegorical character of the image facilitates the inscription of personal and theological narratives of conservative Protestant piety. Most of Warner Sallman’s well-known pictures suggest debts to the work of other religious artists. Sallman found ample material to work from in devotional magazines, illustrations in popular Bible literature, and a host of books on Christian art and the life of Christ illustrated by the work of artists from the 19th and 20th centuries. He is said to have been an avid collector of such images and to have gathered them in his studio (conversation of the author with Charles Bates, July 19, 1991). Some viewers may accuse him of plagiarism. But artists of all time have borrowed from their predecessors, and Sallman never simply reproduced the work of another. What matters in this study concerning the changes Sallman made are the consequences they may have had for reception of his images. Christ in Gethsemane derives from the work of another religious painter, in this case, the painting of Christ at prayer by Heinrich Hofmann. Hofmann’s Jesus in the Garden of Gethsemane, painted in 1890, was widely reproduced in devotional magazines and was often compared with Sallman’s art. Hofmann’s image was frequently the subject of stained-glass windows and of murals painted in church sanctuaries throughout the Midwest during the 1930s, including one by Sallman himself in a church on the south side of Chicago. Sallman modified the German picture in obvious and subtle ways. Both artists constructed their pictures on the basis of a diagonal. Hofmann aligned a ray of heavenly light falling from the upper left with the angle of Christ’s back. In the center of the picture the halo shines about Christ’s head. Sallman reversed Hofmann’s composition and substituted a dark diagonal of rock that parallels the kneeling Christ and silhouettes his glowing tunic, providing part of what a sales catalog described as “a quiet and natural background.” Christ’s face, lifted carefully from the Head of Christ, bisects the stone slope at a right angle, serving to arrest the viewer’s eye once again at the center of the picture. Sallman exchanged Hofmann’s Italianate chiaroscuro for bright and broadly brushed colors. Christ is not placed in the middle distance, but pulled closer to the picture plane and situated in something of an alcove, a partial enclosure that reinforces both his isolation from the sleeping disciples in the distance and his intimate proximity to the viewer. The alcove, a garden-like feature accompanying the altar slab of stone on which Jesus prays, connotes the picturesque silence of the “Garden of Gethsemane,” that oriental place in which the prayer occurs in a final moment of privacy before public humiliation and execution. Both artists conveyed the nature of Christ’s suffering with the thorn bush, but Sallman supplemented the legibility of this suggestion by linking the thorny growth to a shadowy cruciform that is scantily concealed in the rock backdrop in the upper right. Sallman also heightened the emotional state of Jesus by clasping the hands in prayer and furrowing the brow. While Hofmann’s Christ appears to have resigned himself to his fate, Sallman’s remains in a state of beseeching God. Sallman found the idea for this painting in Bernhard Plockhorst’s 19th-century portrayal of the subject, which shows the mother sheep craning its head upward toward its lamb in Christ’s arms. Sallman elevated the viewer above the scene somewhat in order to introduce the colorful landscape. Yet in adjusting the perspective of the landscape and sheep, he did not reduce the height of Christ who towers above the flock gathering about his knees. This characteristic diminution of subject matter may be an important element in the great appeal of Sallman’s work: by making the sheep doll-like, Sallman enhanced their dependence on the paternal savior and gave them a charm that corresponds to the cherubic cuteness of children in such images as He Careth For You.